Henri Ren Albert Guy de Maupassant (Aug 5, 1850 - Jul 6, 1893) was a popular French author who wrote under the pen name Guy de Maupassant. He is considered one of the fathers of the modern short story as well as one of its finest practitioners. His prolific and deeply admired body of work influenced a great number of writers including William Somerset Maugham , O. Henry , Anton Chekhov , Kate Chopin and Henry James . He was a popular writer during his lifetime and had the good fortune to see that his stories were widely read. As a young man he fought in the Franco-Prussian War. He drew heavily on that experience and that war provides the setting for many of his stories which often depict the tragedy and suffering of innocent civilians caught in war's path. He also found inspiration in the not-so-admirable behavior of the bourgeoisie, and made them targets of his biting pessimism and skewering pen. His most famous work for English readers is probably The Necklace. If you are unfamiliar with his works, also consider A Piece of String, Mademoiselle Fifi, Miss Harriet, My Uncle Jules, Found on a Drowned Man and The Wreck as starting points. If you have the stomach for it, you might try his truly terrifying piece of Gothic Fiction, The Hand. Boule de Suif is arguably considered Guy de Maupassant's finest short story. It's a bit long for the short story form, but it's length is justified by Maupassant's mastery and the treatment of his high society targets. The story is a withering criticism of the French society of the late 19th century. Maupassant takes representatives from the different classes and stations of French Society and places them all in the same carriage, which is then accidentally driven behind enemy lines during the Franco-Prussian war. In time, the true character of each participant is revealed as Maupassant passes scathing judgement upon his fellow countrymen. 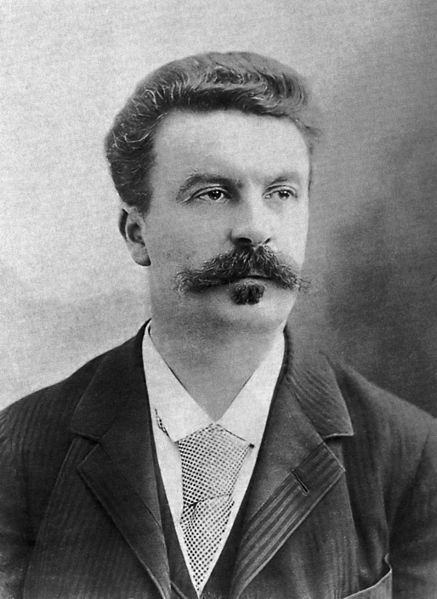 Guy de Maupassant suffered from mental illness in his later years and attempted suicide on January 2nd, 1892. He was committed to a private asylum in Paris and died the following year.